Today in everyday life we use many devices, containing all sorts of levers, switches and buttons. These small items bring in "communication" with the technology of its own amenities, but have one annoying trait – often break down. And most often suffer from keys phones and laptops. If the keyboard of a desktop PC you will be able to replace buttons laptop will have some trouble. However, you will save both time and money. Before fixing the buttons, imagine the principle of their work. Here everything is simple. The button is a plastic, silicone or rubber base that has an inbuilt metal contact. This contact is in contact with the working circuit, causing a short circuit and the corresponding reaction in the apparatus. Most often broken as the time base. In this case, the main task – to save the contact. Plastic buttons often crack or crumble from too frequent or improper use. To repair laptop keys better that way. To start evaluate the extent of the damage. 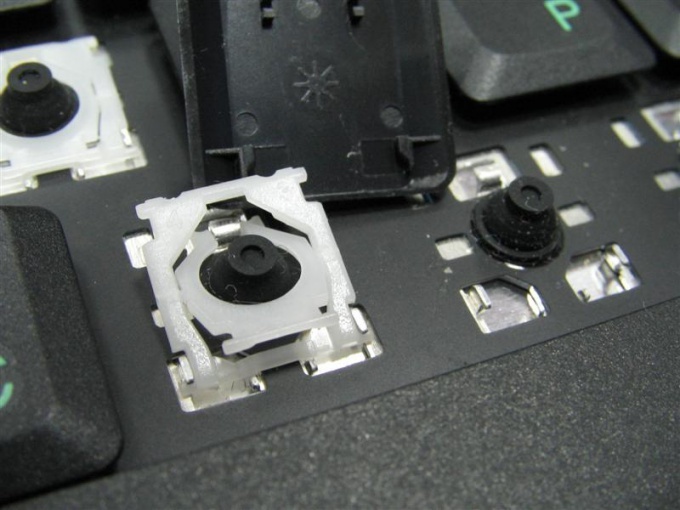 Remove the broken or cracked key and remove it from the laptop casing her pieces, if any. If the key can be glued, try to do it using superglue. Miss them joints, applying the glue as thin a layer as possible. It is very important to establish contact at the same place. If the key to bonding is not subject, try to make it independently of epoxy resin. To do so, except for the epoxy, you will need plasticine to make the shape. The completed form is fill with epoxy, put in her contact (this is often a small metal transactions sufficiently large cross-section). Ensure that contact was properly installed. Having made a key start for its installation. Just keep in mind that done this way the key may have irregularities. So first grind it to fine sandpaper. Instead of epoxy use glue or similar substance. However, the most convenient option – buy a new button and install it. To buy button you will be able to service center, or shop equipment.